Philosophy is a lot like theology: much can go wrong by simply emphasizing one part to the exclusion of others. In theology, we might elevate one attribute of God — justice, but not love. Or grace, but never holiness. 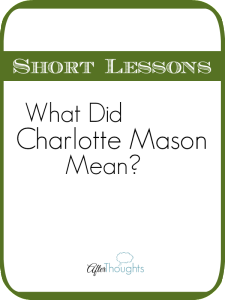 The same sort of mistake is often made in regard to Charlotte Mason’s principles. One of the mistakes I’ve encountered over the years is a focus on the personhood of the child to the exclusion of the rest of the 20 Principles. 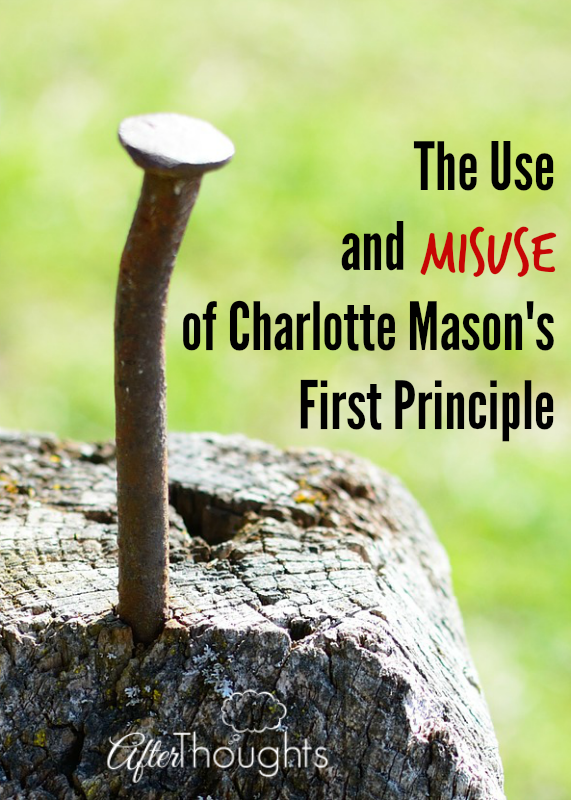 When the first principle is isolated from its original meaning and its context, we get all sorts of practices and beliefs by which Miss Mason herself would have been dismayed. 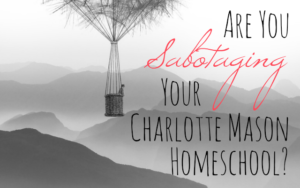 In Charlotte Mason’s sixth volume, she starts off by marveling at this thing we call a child. Here is a wonder of wonders! Here is something God hath wrought. We bow down in reverence — not before the child, but before the God who makes such things. She then begins to explain what she means by the use of the word “person.” I think this is very important because in America, especially, we tend to think that the words “person” and “individual” are interchangeable. We think of personhood in terms of what makes us distinct from others. 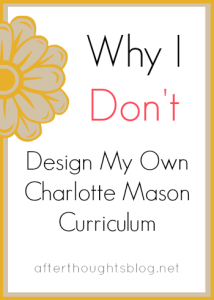 While I do believe that each child is born with his own bent that we must respect, Miss Mason is really focusing on what a person is in the universal sense — what the child has in common with the brotherhood of all mankind. He has his own mind. His education does not produce his mind. He is born thinking and wondering about the world around him, and the questions he asks often have deep or even eternal significance. I am reminded of last week when we were reading a portion of Timoleon and the Corinthians had just defeated the Carthaginians and we are told that 3000 of their most noble people died. A-Age-10, who didn’t even look like she was paying attention during the reading, asked me if these people were Christians. When I replied in the negative, she asked, “So 3000 people just went to hell, just like that?” We talk down and trivialize to our detriment. His mind contains powers of both reason as well as imagination. He has both body as well as mind, and just as his body needs proper food to grow healthy and strong, so does his mind need its proper food, and the name of that proper food is ideas. Just as his intellect comes to us fully furnished, so does his heart. He is capable of great love. He is genuine. He has a conscience. She goes on to emphasize that these things are still true, even if the child is from the slums. The book Left Back has helped me understand the significance of this statement. 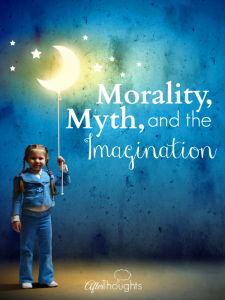 In Miss Mason’s time, even Americans began to believe that there was something of a hereditary class system — that the poor or black or non-English speaking children were not as capable — that their minds were not fully furnished. Even Miss Mason did not always believe as she believed at the end of her life. Certainly she came a long ways from the classism we see in her earlier writing, and this change was likely the result of her working with poor children and discovering for herself that the elite thinkers of her day were wrong, and the poor were equally human (albeit often lacking in vocabulary). Introspection is morbid or diseased when the person imagines that all which he finds within him is peculiar to him as an individual. To know what is common to all men is a sound cure for unhealthy self-contemplation. Here we are talking only about educational applications. 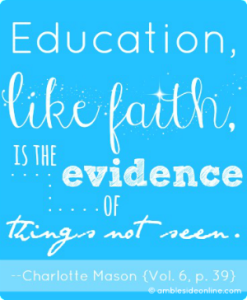 This principle can be applied in areas like parenting, but I couldn’t possibly be exhaustive. I’m confining myself here to the applications Miss Mason herself makes, which I see as primarily two things. First, children are to have their minds properly fed. Every day, we are to offer them truth, goodness, and beauty, and not in small portions. This is their birthright as little humans — as our fellow humans. Second, we are never, ever to manipulate them. Her principles tell us that because they are human, we have only three educational tools: atmosphere, discipline, and life — the atmosphere of living ideas, the discipline of habit, and a generous (life-giving) curriculum. We cannot use other tools which coerce and are therefore inherently disrespectful. I don’t know how else to put this, so I’ve decided to take the blunt route. This is a misuse of the first principle. Miss Mason believed there was a curriculum for humans. I’m not saying that she thought her booklist was the Only Booklist in the World. But generally — science, math, art, music, literature, history — these were the things for mankind. [A] common curriculum (up to the age of say, fourteen or fifteen) appears to be due to all children. 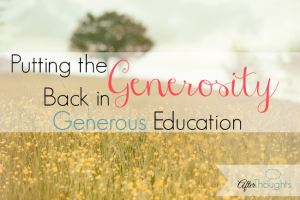 She doesn’t mean here that she believes in ridiculous notions like Common Core, but that all children deserve a broad and generous curriculum. The children do not get to choose, to self-limit due to their own ignorance. Instead, we offer them a feast. Some of them gobble all of it up, and others are extremely picky eaters. But all come to the same table. The meal analogy sometimes falls apart because picky eaters might have an allergy. I will, however, assure you that no children have died of anaphylactic shock due to a math lesson. This doesn’t mean we don’t approach them as persons. They are individuals. 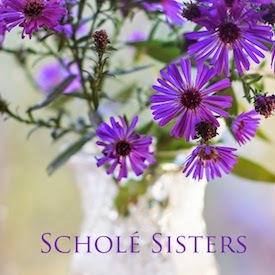 In teaching my daughters to narrate, for example, both of them had their own struggles. One needed to be taught to lengthen her telling. The other needed to learn to be concise. It would have been silly of me to work with both of them on the same thing when they so obviously had their own peculiar weaknesses. Persons are made in the divine image. And also, they are fallen and imperfect. This combination means that while they are are born to think the thoughts of God after him — to glory in math and astronomy and art and literature — they will also have their struggles. There will be times when they do not love rightly. I’ve said this before, but it bears repeating. When I do not love math, I am the one who is wrong. As a teacher, we may be called to go to great lengths to try and woo our students. Children’s individual tastes do not determine the curriculum. The nature of children as persons — as part of the human race and born to a great heritage — does. 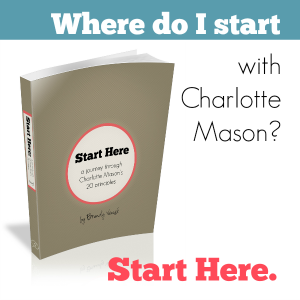 Want to study Charlotte Mason’s 20 Principles for yourself? Well said. Thanks for calling us to provide our children with a daily feast of truth, beauty, and goodness! I’d love to hear what you think if you get a chance to read them. I am so thankful for the time and thought you put into your posts, Brandy. Oftentimes it’s too much for me to take in–lol. But I’m always glad when I slow down and let myself really ponder. Brandy, like what you said about ‘person’ as opposed to ‘individual.’ A child-led approach does seem to be common amongst many who call themselves CM educators. Beautifully expressed Brandy! I too look forward to more. Yes! The oyster! CM actually refers to that one, I think. It really *is* interesting, isn’t it? One thing that has struck me is that it’s like we’re still having the same exact conversation now, 100 years later. That is sort of surreal. This was beautiful to read, so wisely written. Such a blessing. Brandy… will you write yet a second post on children are persons? What it means in how we should then teach them, what we ought to do, and ought not to do in the way we deliver this feast to them. You hinted a bit when you said you teach to their weaknesses, but this has been my stumbling stone… I have not until now truly remember to have this principle present during our lessons. I have let the curriculum and a badly taken information I gather from reading what others do, shape an idol in my mind and blind me to the beautiful persons my girls are. (You know, the comparing, the ideals of where to take them that are noble in themselves but that one, in her pride, allows them to dictate your life and produce angst, or contempt… well, it looks like I have a post to write myself, huh! (I also hinted in my latest post, but you do this so magisterially that it’s so easy for me to ask, lol). “remembered” (argghhh), every.single.comment I make has spelling mistakes! why? sigh. Thanks! I hope you write about the other 19 as well. I know other sites have as well, but I enjoy your eloquence and humor.